Two of the most comforting foods come together in this dish – creamy soup and baked potatoes – making it a sure bet to cure the effects of the cold, dark days of winter. 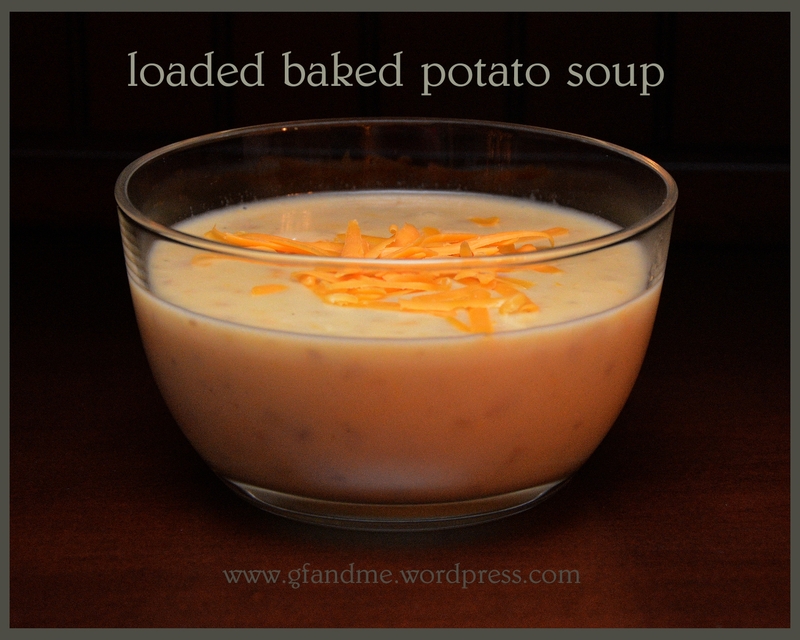 The blended potatoes are what really make this soup thick and creamy and are a great base for the hints of sour cream and onion that come through. To be honest, we like this soup so much (and it’s so easy to make) that we enjoy it year round – especially when paired with our homemade gf croutons! TIP: Best if baked without foil so you get that crispy, tasty potato skin. Melt butter in soup pot and add garlic, onion, salt and pepper. Cook until onions are translucent and just turning brown. Meanwhile, chop the potatoes, skin and all, into cubes about an inch square, and, in a small bowl, stir together the milk and sour cream. Add stock to the soup pot and heat until hot. Once the potatoes are hot, blend the soup with a stick blender (or regular blender) until thick and creamy. Add the milk mixture, bacon or ham if using, and cheddar cheese. Stir and heat until the milk mixture blends into the soup and the cheese melts completely. Pour into bowls and garnish with grated cheddar, sour cream, bacon bits and chopped green onions if desired. This entry was posted in Lunch and Dinner, Recipes and tagged celiac, coeliac, GF, gluten free, gluten free in Red Deer, recipe, soup, vegetarian. Bookmark the permalink. What a delightful recipe! I love it. I also love your new backdrop. A wonderful post. Thanks so much for the kind words. The backdrop is “Hunters in the Snow” by Pieter Bruegel. It’s one of my favorite paintings. Look wonderful! I need to make it. Thanks! The background is a painting called Hunter in the Snow by Pieter Brueghel – one of my favorites. I too am happy to eat hot, hearty soups year-round. There’s something so satisfying about a good thick soup, whether it’s cold out or not…but this does look especially appealing given the weather lately! It’s not even cold now in NYC, but it’s rainy and dreary. Soup weather for sure. Definitely soup weather. Sunny here and minus 3 Celsius – not too bad today!